My goal with this homeschool polymer clay class is to expose the kids to the versatility of polymer clay, so we're doing a wide variety of basic projects and techniques. The second lesson will be marbled beads that can be strung to make a bracelet. Each of these balls is one tenth of an ounce. I used my tiny scale to weigh each one. (It might have been quicker to do some math and roll out blocks and cut them but for various reasons, that wasn't an option.) The bigger chunks are the scraps from last week that need to be re-weighed. Each week, I will know exactly how much clay I want the kids to have and I can tell them to "pick 6 balls of any color" or "choose 4 black balls, 2 brown ones, and 1 green" or whatever. It is a lot of work to prepare the balls but I got my kids to help while we watched TV and that made it go waaay faster. 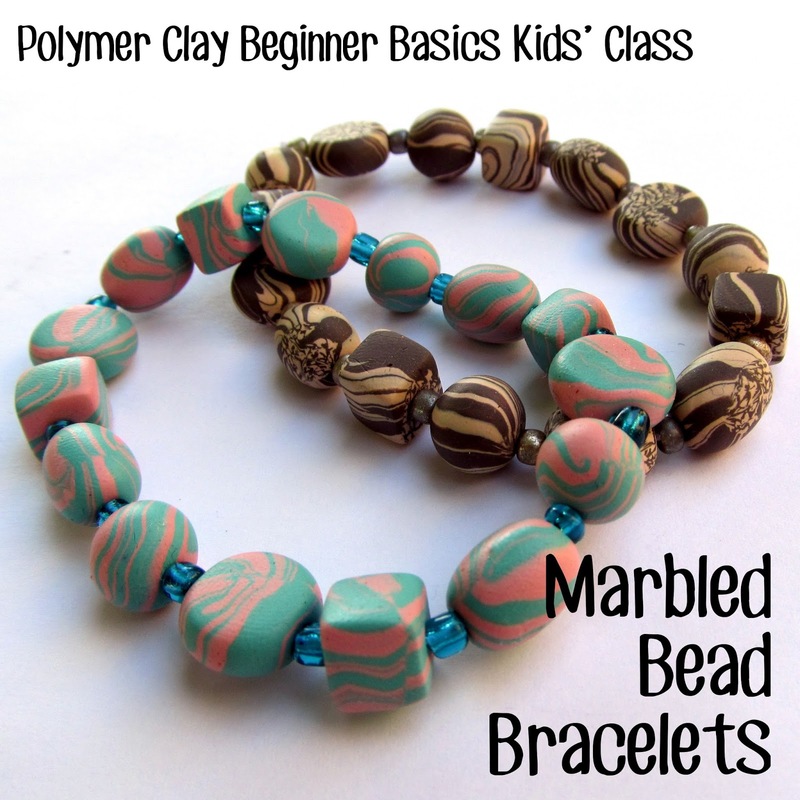 This lesson is intended to teach the kids about marbling (and what happens if you go too far), forming basic shapes and bead piercing. This looks like a long tutorial but it's actually really simple. I just took lots of photos. Mash the matching balls together and roll them into short logs. Pull the slices apart and pile them randomly on the work surface. ... and roll it into a log. ... and fold it in half. and roll into a log one more time. Roll it to 8 inches long and cut into 16 pieces 1/2 inch long each. The cut ends are marbled differently than the sides. You can leave them as is or you can hide the ends. ... until they touch. Press them together firmly. Do the ends of all of the pieces. Roll them all into balls. String the beads on elastic cord with spacer beads between. Get someone to hold the knot tight and put a drop of superglue on it. Trim the ends of the elastic and you're done!